Piles of beads are slowly but surely transforming into mounds of jewelry around here as I prepare inventory for the Texas PTA conference store. You can check out their article, “Pamba Toto spotlight,” here. Danny Philhower, the store director, traveled to South Africa a decade ago with my friend and Pamba Toto co-founder, Debbie Lee and her husband Brian, and he’s never been the same. As he thought about the store, he envisioned a new trajectory for this year. He dreams of ensuring every child has a voice, not just in Texas but around the world. So he called up his old friend Debbie, and thus began my exciting journey of creating jewelry for new friends in Texas! Necklace made with fair-trade pewter from China, resin and glass beads from a “fair-trade standard” cottage industry in Indonesia. Bracelet made from glass beads made by a “fair-trade standard” cottage industry in Indonesia. Necklace made with fair-trade ceramic Kazuri beads from Kenya. Necklace made with “fair-trade standard” metal beads and Coptic cross from Ethiopia. Necklace and earrings made with paper beads (hand-made by friend of Pamba Toto Johanna Josephine) and “fair-trade standard” recycled glass beads from Africa. Fair trade Kazuri (Swahili for “small and beautiful”) ceramic pendant and earrings, made by single mothers from Kibera slum, Kenya. 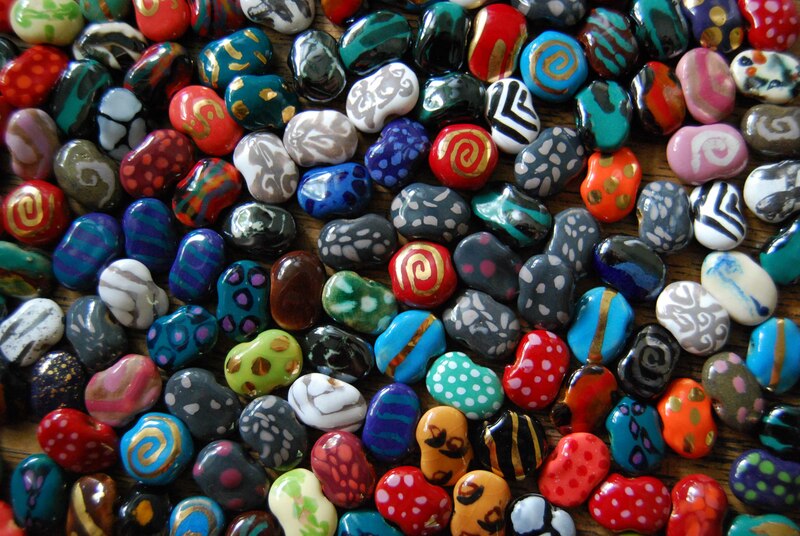 As I bead, I find that my passion for painting translates into making jewelry through an emphasis on color, pattern, texture, simple forms, and incorporating my core values. 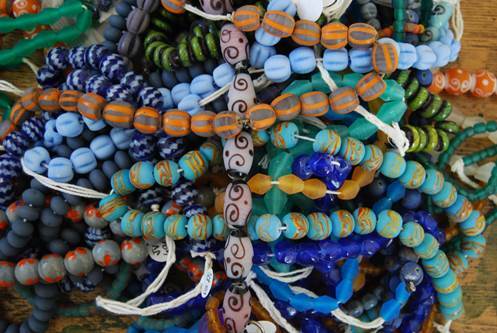 I love to use fair-trade beads, or what we call “fair trade standard” (purchased from dealers who assure us that their practices are fair trade even if they aren’t certified.) Debbie and I scour the world in-person and via the internet to find unique materials. 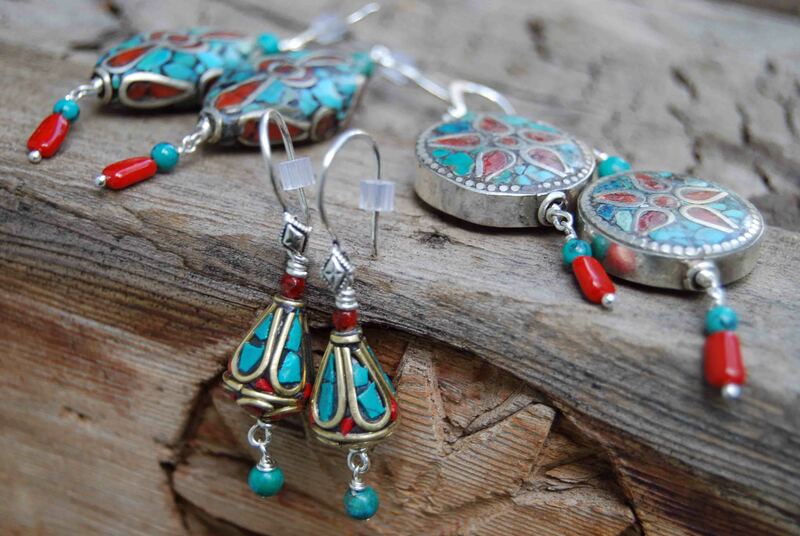 Earrings made with fair trade silver in-laid with turquoise and coral, made by Tibetan refugees in Nepal. I’m thankful for Danny’s vision to transform a normal Texas PTA event into a world-outreach! Through his advocacy he is providing an opportunity for PTA members to fulfill their goals of advocating for every child’s potential to become reality, even orphans in Kenya. I’m just honored to play a small part in it.